THE single driver locomotive originated in England, and is specially identified with locomotive practice in Great Britain. It has had a long and honourable history, and the type was the first to demonstrate the possibility of high speed on the railway. Indeed, until its disappearance, it had always been associated with speed. Some authorities even claim that it was only the constant increase in train loads, which added so greatly to the deadweight, that led to the abandonment of the “single”. unconnected with the cylinder. Cugnot’s second engine, built in 1771, had the same wheel arrangement. Murdoch’s model of 1780, the pioneer of steam traction in Great Britain, was also a three-wheeler designed for road propulsion, but in this instance there was a single leading wheel, fitted with a form of tiller steering similar to that applied to the first motor cars, and the drive was on the rear axle. Richard Trevithick’s model of 1803 was also a three-wheeler “single”, in which motion was imparted to the leading driving axle by a combination of large fly-wheel and small toothed gear wheel. The single driver thus had a relatively long history even before the first locomotive was put on to the railway. George Stephenson’s first locomotives, which were constructed for colliery lines, were four-coupled, an arrangement adopted also on his well-known “Locomotion No. 1”, the first engine to be built for the Stockton and Darlington Railway. An even more famous locomotive of his, “Rocket”, which won the prize at the Rainhill Trials of 1829, was a single driver. “Rocket” had the 0-2-2 wheel arrangement, that is, it had the driving axle in front. similar in general design to “Rocket”, save that its cylinders were horizontal instead of being inclined. For the same railway in the same year Robert Stephenson built “Planet”, one of the first engines whose appearance suggested the locomotive as we know it to-day. This engine, of which the design was widely copied, was a 2-2-0, and had inside cylinders, which added considerably to the neatness of its outline. It has, in fact, been described as “the real point of departure from which the modern British locomotive has been derived”, because of the combination of such features as inside cylinders, crank axle, and multi-tubular boiler. A drawback of the “Planet” class was that, although the engines weighed only eight or nine tons, they were too heavy for the light rails then in use. These were of the fish-bellied pattern, and weighed 35 lb to the yard. Moreover, the locomotives were somewhat unsteady, because they had only four wheels and because the firebox overhung the drivers. A pair of trailing wheels was therefore added, and this 2-2-2 wheel arrangement was embodied in Stephenson’s “Patentee” of 1833. The beginnings of this type are of exceptional interest, since the 2-2-2 wheel arrangement, which was one of the most particularly English of all locomotive types, survived in Great Britain until well on into the present century. A SINGLE DRIVER EXPRESS ENGINE designed by J. Holden for the Great Eastern Railway. The driving wheels were 7 ft diameter and the cylinders 18-in by 24-in. The earlier engines of this class had a boiler pressure of 140 lb; in later engines the pressure was 160 lb. The total heating surface was 1,230 sq ft, and the grate area 17.9 sq ft. The weight, without tender, was 40 tons 3 cwt in working order. As the design of the earliest Continental and American locomotives was so largely influenced by contemporary British practice, the “single” was at one time also often to be met with abroad. For instance, there were built for the Camden and Woodbury Railroad, USA in 1833, two 4-2-0 outside-cylinder locomotives, which were early examples of bogie engines. These two were made in England, but the single driver had previously been constructed in the United States. drive was upon the rear driving axle. This machine has the distinction of being the first locomotive designed in America, but it does not appear to have gone beyond the theoretical stage. “Tom Thumb”, built for the Baltimore and Ohio Railroad, in 1829, and illustrated on page 1025 of this work, had geared drive on to one of its two axles, and cannot strictly therefore be described as a “single”. and the typical American “cow-catcher”. Other typical American features of its design were the large conical chimney, used in the days of wood fuel, and the large and roomy cab, which was introduced at a time when the protection of the enginemen was unknown in Great Britain. A year after “Pioneer” there appeared another American locomotive that was celebrated in its day. This was “Lafayette”, built by William Norris of Philadelphia, who subsequently established locomotive works in Vienna. The locomotive, an outside-cylinder 4-2-0 with an immense chimney that was longer than the boiler and was surmounted by a wide-mouthed top, was one of a class noted for its remarkable powers of adhesion. A sister engine, “Washington”, succeeded in climbing gradients on the Baltimore and Ohio Railroad that had previously been thought impossible to surmount. The success of the class led the Birmingham and Gloucester Railway, subsequently part of the Midland, to import Norris engines for use on the Lickey incline, where cable haulage had previously been employed. These were not only the first American locomotives at work in England, but also the first to be exported from the United States. THE LAST “SINGLE” in regular passenger service in Great Britain, the famous “No. 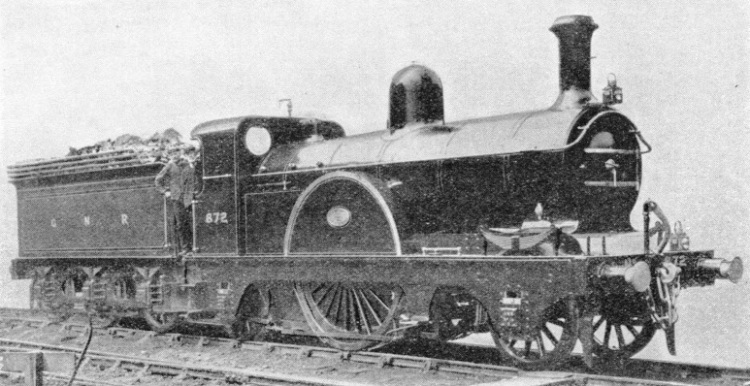 123” of the Caledonian Railway, later Engine No. 14010 of the LMS. The locomotive is shown in its original condition. Its cylinders measured 18-in by 26-in. The diameter of the driving wheels was 7 ft, the boiler pressure was 150 lb per sq in and the total heating surface 1,085 sq ft. The locomotive was withdrawn in 1935.
tyle Railway. This 0-2-4 locomotive is described in the chapter “Unconventional Locomotives”, which begins on page 595. During the period between 1837 and 1841 six-wheeled tender engines with the 2-2-2 wheel arrangement rapidly multiplied. Though they were built at practically every locomotive works in Britain, they possessed a strong family likeness, characteristic features being a short wheelbase, outside frames, long chimneys, relatively large driving wheels, and domed fireboxes. Many also had two domes. 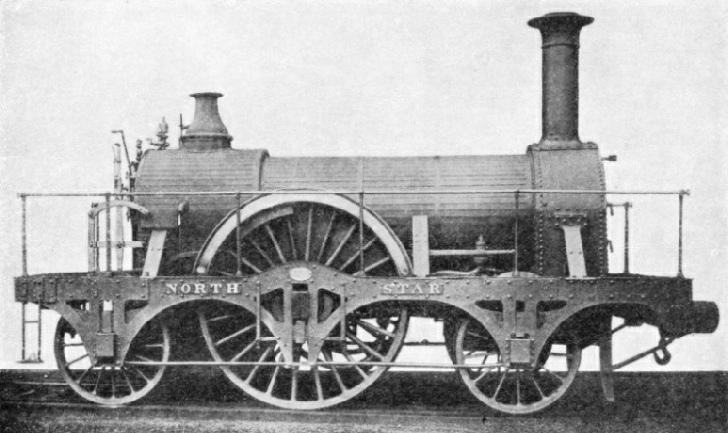 The celebrated “North Star”, which was built in 1837 and worked the first Great Western train out of Paddington on June 4, 1838, was a 2-2-2, and it is of interest to recall that this engine had originally been intended for a foreign railway. With the opening of the Great Western Railway, the real reign of the “single” may be said to begin. It remained the standard on this railway for express passenger work until the passing of the broad gauge in 1892. Even then the type was still so far from being doomed that the broad-gauge eight-wheelers were followed by no fewer than eighty narrow-gauge bogie singles. In addition, a considerable number of 2-2-2’s remained at work. Various types of 2-2-2’s were built for the Great Western during its early days, and in the eighteen-forties the type was also extensively adopted by such lines as the Northern and Eastern, Yarmouth and Norwich, and London and North Western Railways. fuel than the coupled engines in use at the same time. The three fastest booked times in 1845 were all on the Great Western, which specialized in the employment of the “single”. Moreover, the fastest exceptional runs recorded on other lines, such as that from York to Darlington in the same year at an average speed of fifty-one miles an hour, were also made by single-driver engines. “BULKELEY”, a broad-gauge engine of the famous “Iron Duke” 4-2-2 class built in 1880. This Great Western locomotive had 8 ft driving wheels, cylinders 18-in by 24-in, and a total heating surface 1,750 sq ft. It ceased work in 1892, after it had covered 429,548 miles in service. The “single” locomotives designed by T. R. Crampton are described in “The Story of the Locomotive”, which begins on page 151, and therefore need only a passing reference in this chapter. We will now trace the evolution of the single-driver express on the Great Western Railway. This line was originally built on the broad gauge, as were its two principal connecting links, the Bristol and Exeter and South Devon Railways, which were subsequently amalgamated with it. At a relatively early date the inconvenience of having two track gauges on the railway system of the country became manifest, and in 1845 a Royal Commission investigated the position. One effect of its recommend-ations, which spelt the doom of the 7 ft 0¼-in gauge, was to stimulate engineers to build locomotives of greater power. considerably above the average for British locomotives of more than a generation later. Daniel Gooch, the designer, was justified; one of “Great Western’s” recorded performances was to run the 77.3 miles from Paddington to Swindon in seventy-eight minutes, with a train of a hundred tons, an unusually heavy load for those days. On another occasion, a few days later, it covered the 193½ miles between London and Exeter via Bristol in 208 minutes, but shortly after this performance the leading axle broke, and “Great Western” was then fitted with an additional pair of leading wheels, converting it into a 4-2-2. We thus get the origin of the “Iron Duke” class, which included “Lord of the Isles”, perhaps the most famous of all “singles”. Between 1847 and 1851 twenty-two eight-wheeled single-drivers were built at Swindon, six of the “Iron Duke” class and sixteen of the “Courier” class (modified “Iron Dukes”). The “Iron Dukes” had a heating surface of the then unprecedented figure of 1944.8 sq ft. The pressure was originally 100 lb to the sq in, but was afterwards increased to 115 lb. The cylinders were 18 by 24-in. The boiler was domeless, steam being taken from a perforated pipe that ended at a regulator box in the smoke-box. In their original form the driving wheels were without flanges, a feature that for years after remained a characteristic detail of Great Western practice. Seven more “Iron Dukes” were built by an outside firm in 1854-55. Thus, including “Great Western”, there were thirty engines of this class. With alterations, including the provision of a cab, it survived until 1892. Most of the original machines were broken up between 1870 and 1880, but they were replaced by engines of virtually similar design, in which, however, the pressure was further increased to 140 lb. Considerable mileages stood to the credit of many of these engines; that of “Lord of the Isles” was 789,309. A GREAT EASTERN EXPRESS ENGINE designed by Massey Bromley in 1879. The cylinders measured 18-in by 24-in, and the driving wheels had a 7 ft 6-in diameter. The heating surface of the first ten engines of this class was 1205.6 sq ft. The grate area was 17.1 sq ft, and the boiler pressure was 140 lb per sq in. The engines were built somewhat after the design of Patrick Stirling’s 8 ft Great Northern “singles”, but differed in their details. An inevitable result of the findings of the Gauge Commission, which advocated that no further broad-gauge lines should be built save under certain specified conditions, was that at a relatively early date much of the Great Western locomotive stock became either standard or mixed gauge. The first standard-gauge engines constructed for the company were built as early as 1855. These were six-wheeled single drivers to the designs of Gooch; and it is to be noted, as an instance of the influence of the narrower gauge on dimensions, that the total heating surface was only 1,112 sq ft, or approximately two-thirds of the six-wheeled broad gauge “Great Western”. This 1855 class was of neat design; it had inside cylinders, was domeless, had the characteristic Great Western long, low tender, and, save for the absence of the additional pair of leading wheels, followed closely on the lines of the broad-gauge eight-wheelers. and 1902 as six-coupled tender engines, when the original frames and motion were retained. the only one to have a dome, the remaining twenty being without one. The heating surface of these engines was 1278.5 sq ft, the pressure 140 lb, and the weight in working order 33½ tons (without tender), of which 14 tons were on the driving axles. They were subsequently rebuilt with domes, and the weight was increased by a ton. They were employed to haul many of the fastest express trains until the beginning of the present century. described as “probably the most graceful express engines of their day”. For twenty years they hauled fast trains between London and Swindon and London and Wolverhampton. “PRINCESS ROYAL”, one of the “Lady of the Lake” class engines built by J. Ramsbottom for the LNWR between 1859 and 1865. They had cylinders 16-in by 24-in, driving wheels 7 ft 7½-in diameter, a total heating surface of 1,098 sq ft, and a grate area of 14.9 sq ft.
except that it was domeless, had an unusually long boiler, and had bogies of such faulty design that the engine was apt to leave the track. Little record of its service survives. No. 9 established the reputation of being powerful, but not so fast as the standard six-wheeled “singles”. As originally, built, it had 7 ft 8-in driving wheels, but these were afterwards reduced to 7 ft, as was also done with a somewhat similar engine, No. 10. The two used for a time to work alternately the heaviest South Wales expresses between London and Swindon. We come now to the last phase of the “single” on the Great Western Railway, and it makes an unusually interesting chapter in locomotive history. As already mentioned, the Great Western had ceased to be an entirely broad-gauge line long before 1892, when, in fact, only a relatively small mileage remained to be converted to standard gauge. “ROVER”, a Great Western 4-2-2 broad-gauge engine. This locomotive, built in 1871, was reconstructed in 1888 and ceased work in 1892. The cylinders measured 18-in by 24-in and the diameter of the driving wheels was 8 ft. Its total mileage was 787,174.
with a view to their ultimate use on the 4 ft 8½-in tracks. STROUDLEY’S EXPRESS ENGINE, built for the London, Brighton and South Coast Railway in 1874. The cylinders measured 17-in by 24-in and the driving wheels had a diameter of 6 ft 9-in. The total heating surface was 1,132 sq ft and the boiler pressure was 150 lb per sq in. Later engines of this class had the driving wheels reduced to 6 ft 6-in. Four batches were built in all. The first eight, the convertibles, were followed by twenty-two that had also first been built as six-wheelers. Then followed another thirty, after which came the final twenty. The class was numbered from 3001 to 3080. They were all named, and the fact that the names of several underwent one or more changes illustrates one of the difficulties of writing locomotive history. In their final form, the design of some of the class was modified, including the fitting of extended smoke-boxes, American pattern fireboxes, and the removal of the domes. One of the class, “Duke of Connaught”, figured in the last part of the record-breaking run from Plymouth to London on May 9, 1904, described in the chapter “Locomotive Speed Records”, which begins on page 529.
had a diameter of 7 ft. The locomotive was one of the most successful of the Great Western Railway’s early engines. These Great Western engines have several special claims to historical interest. They were built to carry on the traditions of the fastest broad-gauge express engines; they were the most numerous individual class of bogie single-driver ever constructed; and they also rank among the last of the “singles”. None of this historic class remains. They were all scrapped between February 1908 and December 1915, the first to go being No. 3020, “Sultan”, and the last, “Royal Sovereign” and “Princess Helena”. The names of some of the class were taken from their broad-gauge predecessors, such as “Great Western”, “Great Britain”, “Iron Duke”, “Tornado”, “Hirondelle”, and “Lord of the Isles”. During the period that the Bristol and Exeter was a broad-gauge system, with an existence independent of that of the Great Western, its locomotive superintendent, William Pearson [sic], followed Gooch in the construction of “single” engines with large driving wheels. Incidentally, this line owned the first rail motor of which we have any record - a combined coach and engine, the latter having single driving wheels of 4 ft 6 in diameter. The vehicle was built in 1848, a year before the construction of a similar motor coach for the Eastern Counties Railway, subsequently known as the Great Eastern. Little is known of the performance of either. features of the design were that the firebox was provided with transverse water tubes, and that the driving wheels, which supported 18½ tons of the load, were without counterweights. tender engines, the trailing bogie, with wheels 4 ft in diameter, being replaced by a single pair of 4 ft 6-in wheels. The large driving wheels were cut down to 8 ft, and the weight on them was lessened. As reconstructed, two of these tanks remained at work until the passing of the broad gauge. There were also two other ten-wheeled tank engines, with 7 ft 6-in drivers, which were built in 1862, and one of which remained in its original form until sent to the scrap heap about 1887.
between 1886 and 1894. The driving wheels had a diameter of 7 ft 7½-in, the cylinders measured 18½-in by 26-in, total heating surface was 1,045 sq ft, and boiler pressure 160 lb per sq in. The Bristol and Exeter ten-wheelers were of an exceptionally neat design, since the lines of the boiler were not marred by tanks, the water supply being carried in small side tanks over the bunkers. Both types had splasher-less driving wheels surmounted by a metal beading, and the 1868 class were equipped with cabs, which, although open at the sides, afforded the engine-men protection at the front, rear, and top. Reference has been made to the fact that these ten-wheelers were with-out counterweights. In contrast was the Bodmer “balanced” engine, of which a typical example was the six-wheeled single type built in 1845 for both the Brighton and South Eastern Railways, one for either system. Bodmer, a Swiss who settled in Bolton and later built a small number of locomotives in Manchester, patented a device embodying the use of two pistons moving in opposite directions in the same cylinder. The stroke was 15-in, but the double piston arrangement made this the equivalent of 30 in. Very little is on record concerning the performance of the South Eastern engine, but the one built for the Brighton line remained at work in its original form until 1859, when it was reconstructed on orthodox lines with new 15-in cylinders. Some noteworthy six-wheeled single-drivers for express passenger work were built between 1856 and 1857. These included an inside-cylinder type for the Edinburgh and Glasgow Railway, and locomotives with outside cylinders for the London and South Western and Glasgow and South Western. The latter were remarkable for their resemblance to the London and North Western’s “Lady of the Lake” or “Problem” class. This class, which was introduced in 1859 by John Ramsbottorn, had outside cylinders, and 7 ft 7½-in driving wheels, the largest, save for the “Cornwall”, ever used on the LNWR. between London and Crewe during the first “Race to Scotland” in 1888. Although the “Problems” were small - their heating surface was only 1,098 sq ft, and the weight in working order 27 tons 5 cwt - they remained in express service for well over fifty years, a fact partly, but not entirely, due to the London and North Western’s long-continued practice of “double heading” express trains out of Euston. Some survived until the present cent-ury, but the whole sixty were withdrawn from service before 1910.
and 7 ft driving wheels. Their designer disbelieved in the low, centre of gravity theory and placed the boiler centre 7 ft 1-in above rail level. He was also a believer in high boiler pressures, and, as originally built, the “Bloomers” worked at 150 lb, which, was, however, later reduced to 120 lb by Ramsbottom. Forty in all were built of the first type, and until as late as 1880 most of the expresses between Euston, Rugby, and Birmingham were worked by them. There were also thirty-six similar engines, known as “Small Bloomers”, which had 6 ft 6-in driving wheels. REBUILT. A Ramsbottom 2-2-2 after its reconstruction and the addition of a cab. The “Lady of the Lake” class, rebuilt by F. W. Webb in 1895-99 had the fireboxes enlarged and the boiler pressure increased from 120 to 150 lb. The diameter of the driving wheels was increased to 7 ft 9-in by the addition of thicker tyres. Sixty of these locomotives were built. was represented by a combustion chamber. The working pressure was 150 lb. placed outside, and, with the exception of “Cornwall”, was the only engine of this wheel arrangement ever constructed for the North Western. It was subsequently rebuilt as a six-wheeler. Western 2-2-2’s of 1854 deserve a place in locomotive history as being among the few saddle tanks to have this wheel arrangement. We may recall also the neat six-wheeled single-driver express engines running on the Midland and Great Northern at the same period, and the Stephenson 2-2-4 side tank built for the Viceroy of Egypt in 1859, an ornately decorated machine, with a built-on passenger compartment whose roof was surmounted by two crowns. The celebrated Caledonian 2-2-2’s, with outside cylinders and 8 ft driving wheels, were introduced in 1859, and did excellent work as late as 1884 in hauling the Scottish expresses between Carlisle and Edinburgh and Glasgow. type with an excellent record of service on the Great Western, Great Central, Great Northern, Midland, Great Eastern, and North Eastern, and other railways. Those built for the North Eastern included a number of two-cylinder compounds, constructed at a period when the “single”, after falling into temporary disfavour on certain railways, had again come into fashion for express passenger work. heating surface of 1719.2 sq ft.
SACRE’S SINGLE-DRIVER LOCOMOTIVE (1882-83), built for the Manchester, Sheffield and Lincolnshire (later Great Central) Railway. The cylinders measured 17½-in by 26-in and the driving wheels had a 7 ft 6-in diameter. The total heating surface was 1,144 sq ft, the grate area 17 sq ft, and the boiler pressure 150 lb per sq in. features of their design were the absence of a dome, pierced driving-wheel splashers, and a disproportionately small cab that detracted a trifle from the otherwise handsome appearance. Cylinders were 18 by 28-in, the heating surface was 1,165 sq ft, and the working pressure 140 lb. The type proved itself eminently suitable for the work for which it had been designed, that of hauling the fastest and heaviest expresses, and by the end of 1895, fifty-three were in service. They were not, in accordance with the general practice, built in batches of ten or more at a time, but left the “shops” in twos or threes, and various modifications were introduced on the later engines, including the boring out of the cylinders from 18 to 19½-inches. The last six also had the heating surface reduced to 1,032 sq ft. The heating surface appears to have been unduly small for the comparatively large cylinders, especially when it is remembered that H. A. Ivatt’s Great Northern “Atlantics” of 1902 had 2,500 sq ft of heating surface to supply cylinders only 18¾-in by 24-in. Be that as it may, the Great Northern “singles” did excellent work. The period between 1890 and 1901 may be regarded as the last stage in the building of single-driver express locomotives. Many of the important British railways brought out final examples of the type. The engines had graceful lines and were generally efficient for their size. which begins on page 1046. As far back as 1874 W. Stroudley had built some 2-2-2 locomotives for the London, Brighton and South Coast Railway; but, by the end of the nineteenth century, the companies now forming the Southern Railway had shown their preference for coupled locomotives. The Midland Railway, had two main classes of “single”. The “115 Class” had 7 ft 9-in driving wheels, cylinders 19½ by 26-in, a total heating surface of 1,233 sq ft, and a grate area of 21.3 sq ft. The working pressure was 170 lb per sq in, and the total weight in working order and without tender was 47 tons 2 cwt. The “2601 Class” had driving wheels of half an inch greater diameter. The cylinders were of the same dimensions as those of the preceding class. The total heating surface was slightly smaller at 1,217 sq ft, and the grate area larger at 24.5 sq ft. Working pressure was higher at 180 lb. The total weight, in working order, without tender, was 50 tons 3 cwt. One of the “2601 Class” was exhibited at the Paris Exhibition of 1900.
wheels remained unaltered. The total weight in working order, without tender, was 46 tons 19 cwt. Great Eastern “singles”, of the “10 Class” had driving wheels of only 7 ft diameter, and cylinders 18-in by 26-in. The total heating surface was 1,292.7 sq ft, and the grate area 21.3 sq ft. Working pressure was 160 lb per sq in, and the total weight, in working order, without tender, was 49 tons. These “singles” were fitted for burning oil fuel. surface was 1,194 sq ft, and the grate area 24.8 sq ft. Working pressure was as high as 200 lb per sq in, and the total weight, in working order, without tender, was 47 tons 5 cwt. The last “singles” built for a British railway were some Great Northern Railway 4-2-2’s which appeared in 1900-1. They had cylinders 19 by 26-in, 7 ft 8-in driving wheels, a total heating surface of 1269.6 sq ft, a grate area of 23.2 sq ft, and a working pressure of 175 lb per sq in. The weight, without tender, in working order, was 48½ tons. These engines were all scrapped by 1918. As a class, the Midland Railway “singles” survived longer than any others. The last British “single” to remain in service was the former Caledonian Railway No. 123 (LMS No. 14010), which distinguished itself in the “Railway Race” of 1888, and was not withdrawn until March, 1935. ON THE GREAT NORTHERN RAILWAY. A 4-2-2 express engine of the type deigned by H. A. lvatt, in 1900-1. The GNR “singles” were the last to be built for a British railway. They had 7 ft 8 in driving wheels, cylinders 19-in by 20-in, a total heating surface of 1269.6 sq ft, a grate area of 23.2 sq ft, and a boiler pressure of 175 lb per sq in. You can read more on “The Evolution of Compounds”, “A Famous Locomotive Type” and “The Story of the Locomotive” on this website.